Imagine a situation, where a potential customer enters your trade show stand and is interested in a particular product, but the responsible contact person can't be found and the customer is put off. "Never mind" thinks the potential customer and keeps walking to the next stand of your competitors. With our team coordination function it can be prevented. Who is currently talking to a client, who is on a break, who is the sales representative of Mrs. Mayer? With Pitchview each team member can give an answer straight away. Every employee has a real-time access to your digital shift schedule and can call employees directly from the app or contact them via SMS. Every employee can log in and log out easily. Push-notifications remind employees to use scheduler. 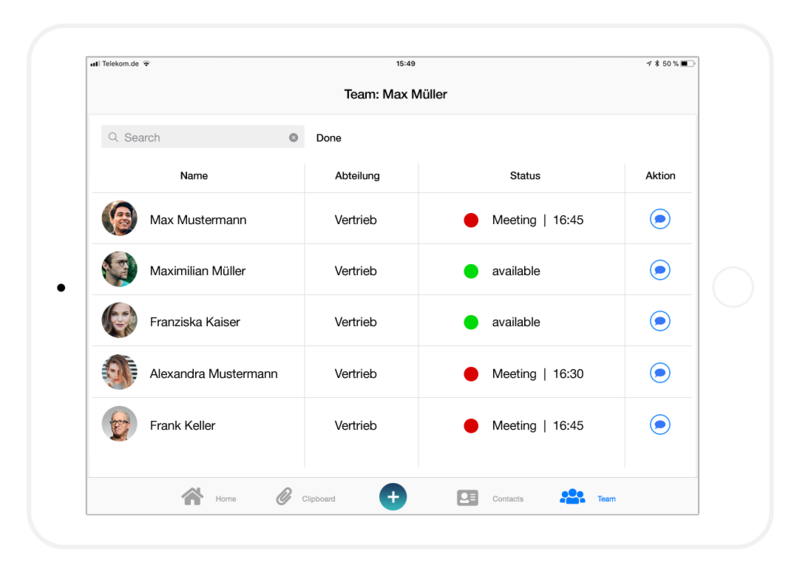 In just 3 clicks your entire team knows if you're on a break, at the meeting and when you'll be available again.